Whether it's making your way to Paris, running a marathon, or being able to see your grandchild get married, new research suggests there's good reason to tell your doctor what's on your bucket list. Researchers from Stanford say sharing these life goals with your physician can lead to a medical plan that better aligns with your priorities, and it may even help encourage healthier behavior. 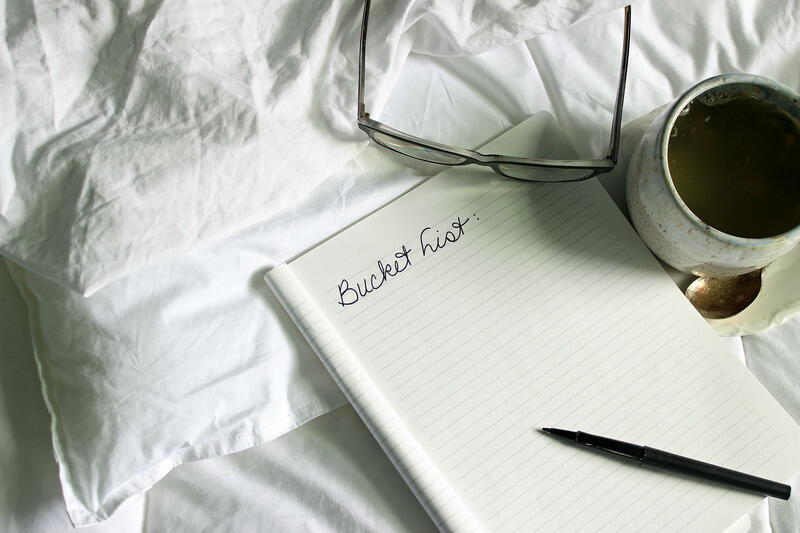 For the study, published in the Journal of Palliative Medicine, they surveyed more than 3,000 people across the United States and found that 91 percent had a personal bucket list -- a list of things you'd like to do before you die. "When you just Google the term 'bucket list,' it's huge how much interest there is in this," Dr. VJ Periyakoil, the lead author of the study and a clinical associate professor of medicine at Stanford, said in a statement. "It provides a very nice framework for thinking about your life goals, health and your mortality." For physicians, knowing this information can help them motivate patients and encourage healthy behavior. Previous research has found that doctors talking to their patients about their future goals can be a vital part of advance-care planning, particularly for people with a chronic or terminal illness. While these conversations can be difficult, especially when they are about the end of life, the researchers say having the talk helps ensure patients get the right care. "If a patient wants to attend a beloved grandchild's wedding or travel to a favored destination, treatments that could potentially prevent her from doing so should not be instituted without ensuring her understanding of the life impact of such treatments," the study states. Periyakoil recalled a patient of hers who had gall bladder cancer. "He was really stressed because he wanted to take his family to Hawaii but had treatment scheduled," she said. "He didn't know he could postpone his treatment by two weeks." After discussing his options and the side effects of the cancer treatments, he and his physician decided to postpone the treatment so he could make the trip with his family. He started cancer treatments when he returned. "When doctors make recommendations, patients often take it as gospel," Periyakoil said. The researchers say having a conversation about a bucket list is more natural and much less intimidating than filling out an advance directive, or a written statement of a person's wishes regarding medical treatment at the end of life.